The Kingston 32GB Class 4 Secure Digital High Capacity (SDHC) Memory Card offers larger-volume data storage and optimized recording performance with support for FAT 32 file formats. In addition, this card complies with Kingston's Class 4 speed rating, which means that the card provides a minimum data transfer rate of 4MB/sec., for optimum performance in professional cameras and other high performance devices. Although apparently identical to standard SD cards, SDHC cards are designed differently and are only recognized by SDHC host devices. To ensure compatibility, look for the SDHC logo on cards and host devices. 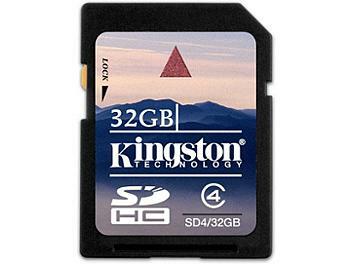 Kingston's SDHC cards use the Kingston "Class" speed ratings. These ratings include Class 2, which provides a minimum data transfer rate of 2MB/second, Class 4, which provides a minimum data transfer rate of 4MB/second, and Class 6, which provides a minimum data transfer rate of 6MB/second.